Pop Clouds ejuice flavor: cherry. Cherry Candy eliquid by Pop Clouds. If you love sweet fruity flavor, you're sure to cheer for Pop Clouds Cherry Candy E-Juice. 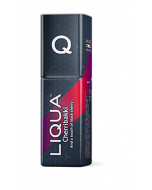 The 70:30 VG:PG e-liquid brings to life the tempting taste of wild cherry hard candy with a soft throat hit that keeps you focused on the flavor. A fizzy twist makes every hit an invigorating experience.